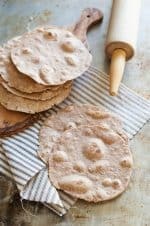 Our family has probably eaten thousands of these Clean eating spelt tortillas over the years. They are great plain, cooked in oil in the frying pan, with butter on and then broiled in the toaster oven, as a thin pizza crust, as quesadillas, toasted with cinnamon & sugar, as a sandwich wrap, and for all the regular Mexican dishes. They have very few ingredients and my children LOVE to help make them. I make them often when I run out of bread to tide us over for a while until we can get to the store or can find time to make spelt bread in our bread maker. 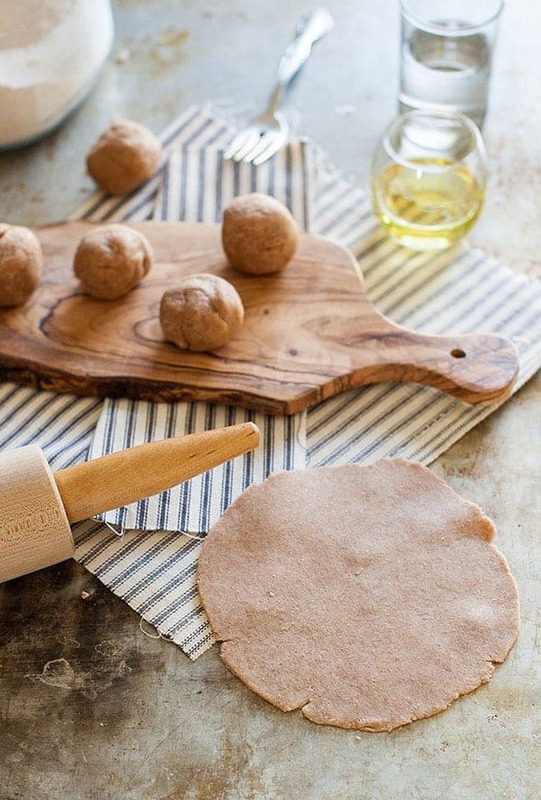 There are many different types of flour you can use to make these tortillas. My favorite flour to make these with is einkorn flour. First of all, einkorn is my favorite flour I’ve ever tried, and I happen to think it’s the healthiest. You can read more about einkorn flour here. I like einkorn with these because they turned out really light, white, fluffy and just have a good taste. They are easy to do thinner and the dough is really soft when you are rolling it out and kneading it. Whole wheat spelt is the type of flour used in the photos and it tends to be drier and has a stronger flavor, similar to regular whole wheat flour. White spelt flour is my second favorite flour since it’s very similar to regular white flour. If you want to learn more about spelt flour, please start by reading this spelt flour article. 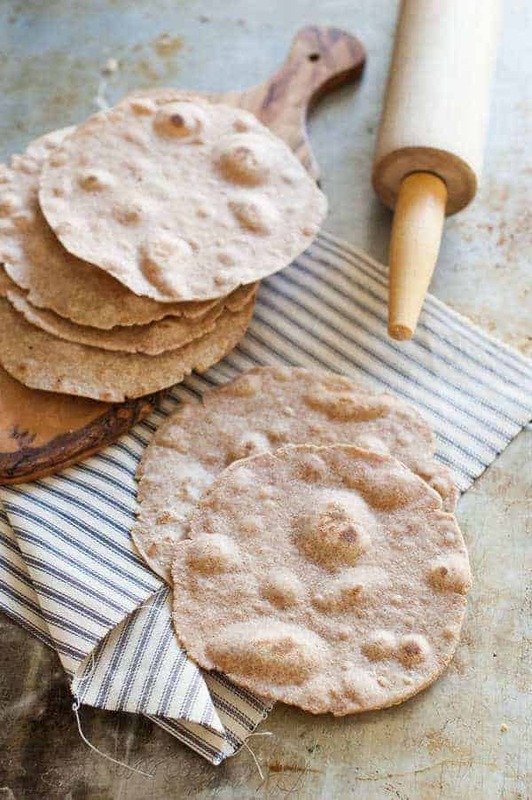 Here are some tips to get the best spelt flour tortillas – don’t skip the step of mixing the first three ingredients together before you add the water. I just use a fork and keep working the oil in until most of the flour is wet. Then slowly add in the water. The amount of water you need totally varies depending on the type of flour, humidity of the room, temperature, elevation, etc. so just keep adding until it forms a ball that’s a little sticky. Letting the dough rest for 15 minutes is not totally necessary, but it really does roll out better and they are softer and stretchier if you do, so resting is better if you have time. Sometimes if my kids can’t wait to eat one, I’ll cook a few for them and then let it rest a little before I make mine. I’d say the main difference I notice if I don’t let them rest is that they are harder to roll out. Make sure your pan is good and hot before you start cooking them, otherwise they basically get dried out. They really do taste better if your pan is hot – and they cook faster too. We often eat them hot right out of the pan, but if you do have leftovers I usually keep them on the counter for a day or two and then move them to the fridge. They will last a few weeks in the fridge, but they do get dried out and aren’t good cold, but are perfectly fine heated up. Those are usually the kind we use to put butter on and broil or as thin pizza crusts in our house. The little pizzas are perfect for me since I try to eat low carb and good for children’s lunch boxes since they only take a few minutes to make and they don’t take up too much room in their lunch boxes. Please let me know if you try the spelt tortillas. I’d love to hear how they turn out for you and if you like them. I’m pretty sure our family would have starved if we wouldn’t have started making these years ago. I love this Clean Eating Tortillas Recipe.They only take a few minutes to cook. I’ve made these hundreds of times. These can be used for tortillas, tacos, low carb pizza crusts, wraps, etc. Mix the flour and salt together in a mixing bowl. Mix in the oil. 1/2 cup of the water and mix in, adding in the last tablespoon little by little, until slightly sticky dough forms. You may not need all of the last tablespoon of water. If you are using whole grain spelt flour you will probably need a little more. Dust a work surface with more spelt flour and knead the dough until it is no longer sticky and soft, about a minute. 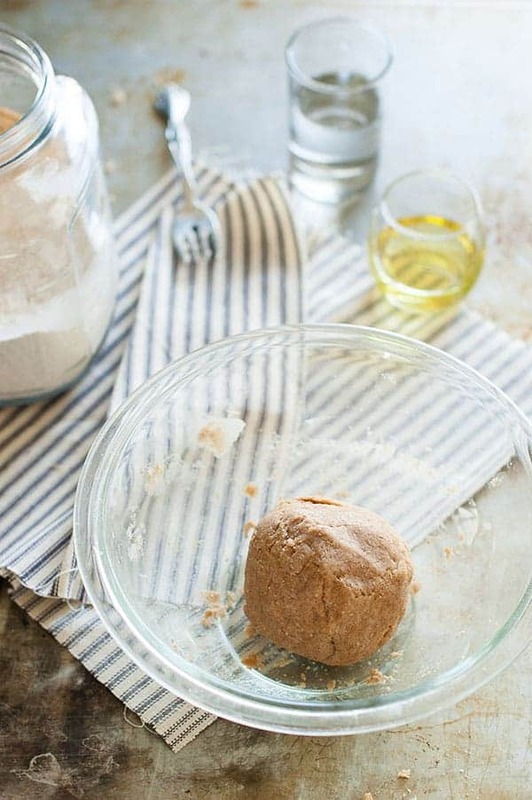 Divide the dough into 12 balls and cover with a cloth. Let rest for 15 minutes. Roll each ball into a very thin circle, about 6 inches in diameter. Cook each tortilla for about 30 seconds on each side, or until it starts to bubble up. Hi! I just finished making spelt tortillas. I LOVE them! And most important- my kids love them too. Could these be made ahead and frozen after they are rolled out and before they are cooked? So I could just take them out of the freezer and cook them, like the uncooked tortillas you can buy at Costco. I usually make it in to 8 balls so just take the whole ball and break it in to 8 pieces and you’ll know the size. Thank you so much for the spelt tortilla recipe. Made them tonight and they are both easy and tasty! I never heard of the word Spelt used for a tortilla. 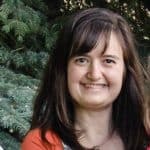 Is it something different? Spelt is a type of flour that a lot of people with a wheat allergy can eat. You can cook with it just like wheat flour. If you look on the post, there is a link to make it easy for you to buy it on Amazon. You could always just use this recipe with regular flour too and it will turn out great. Thanks for the clarification. The main thing I know is that it tastes good, is easy to work with, is good for me and is easier to digest than regular wheat. Thanks for the recipe!! I love tortillas! !